The smooth green ones were replaced by grainy green… and I guess maybe the grainy green ones didn’t sell well? Maybe they’re temporarily out of stock? I really don’t know. Not sure what’s going on but it doesn’t look good, both sellers (Mtn and I-O) are no longer showing green as an option. Only Black, Grey and Cyan. RMM has previously christened it as ‘The Chinese way of doing business’. As with the Meteors, the first to be released revealed issues to be corrected, the V2 models had the best quality anodizing. Color varieties and emitter options expanded, the finish work was stunning at first, then became less satisfactory to some of us. Richard had to discount some lighter colored versions to get rid of them. When the price was lowered 50 bucks to match the Manker response to the Meteor, corners had to be cut. HWangs’ lights are milestones, his reputation unique, almost hero-like, but he does have to compete after all. Meteors are about as flawless as you could hope for, but a pattern seems to have been set. If they were going to discontinue the green color I wish they would have made it known in advance. Not sure how that works though in the grand scheme of retailing. But had I known the green was going bye bye, it most likely would have caused me to “fall off the fence” and grab one while I could. When you think an item (for the most part) is always going to be available, you get a feeling you can take all the time you need to decide. The SC52w isn’t high-CRI. However, the SC52c and SC52d are. Doesn’t mean they won’t be green though. I’ve heard ZL’s high-CRI options, especially the older ones, were pretty green. The SC52w isn’t high-CRI. However, the SC52c and SC52d are……. Hmm, maybe not. There was a SC52d though, and it’s weird that they’d offer the ‘d’ version without a matching ‘c’ version. I wonder why they did that. Thanks for the correction. Meant to say neutral white. Anyone have success modifying ZL’s? The AA form factor looks like it’s a no-go… can’t see any easy way to access the emitter without damaging the light. The SC600 MK3 HI remains my favorite light, with ROT66 SST20 4000k 95cri behind it. It’s as you said, the UI, size, build quality, tint, efficiency, build quality are all top notch. Nothing quite comes close to performing as well in a complete package. The SC52d used a Phillips Luxeon emitter, then ZL switched to CREE for later models. CREE offers a wider range of HiCri emitters, and suffer less lumen loss when compared to standard and ‘w’ emitters. Another complaint from some people about the Luxeon was due to the smaller hotspot. I quite like my Zebras. SC600w IV Plus is a great light. 2200 lumens and just slightly larger than an Emisar D4. Run them both on turbo and the D4 ramps down to maybe 300 lumens within a minute, while the Zebra keeps going at around 1000 lumens indefinitely (when held in hand), without ever becoming too hot to touch. Put another way, within 15 seconds of turning on both lights in turbo, the Zebralight is already considerably brighter than the D4. Unlike the D4, the Zebra experiences no rapid rampdown due to heat. 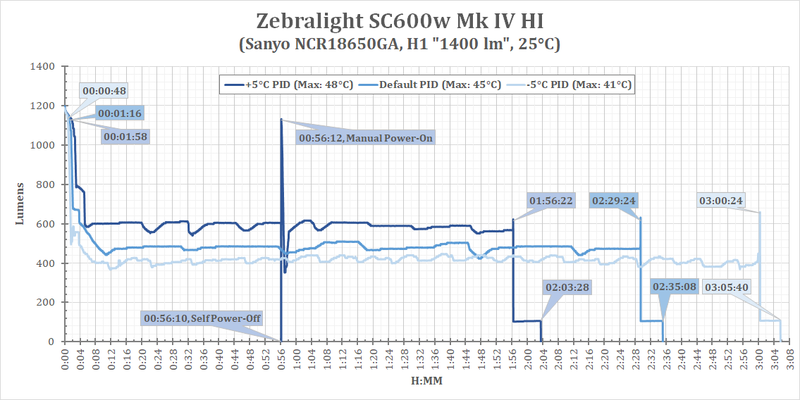 Zebralight really knows what they are doing when it comes to heatsinking. They truly are great lights. Of course it’ll drop down quickly when it’s running at 3000+ lumens. 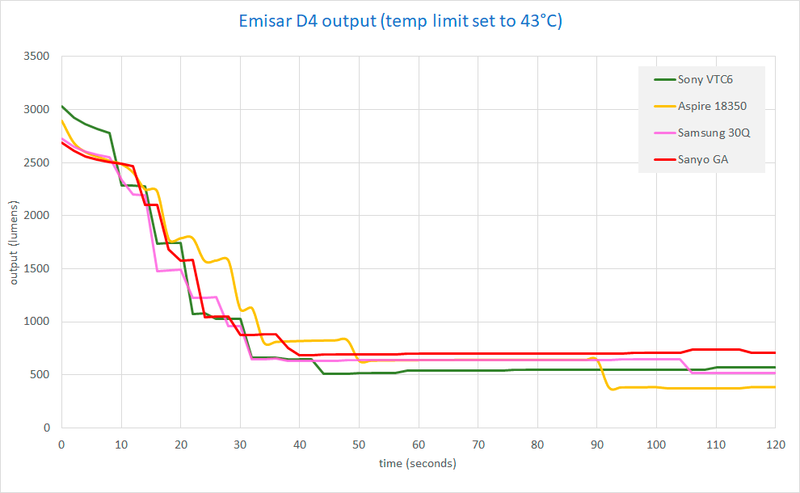 What if you set the D4 to the same lumen output as the ZebraLight, then do a runtime graph with both, using the same cooling conditions? Comparing apples to apples, so to speak. So everything equal, which one runs longest? ZebraLights should run the longest at a given lumen level. They tend to have some of the most efficient drivers on the market. That’s what I thought but after researching regulated vs non regulated drivers, I still can’t quantify the difference. Is it 10 minutes or 60 minutes more run time for instance? It would have to be significant to warrant spending twice as much over the D4 which I have and love. Could you give me a ball park figure. I know there are many variables. 5.5 hours, when light steps-down. Cell voltage is 2.87v. 4.85 hours until step-down. Cell voltage 2.80v. On a Sanyo GA cell, I get 18% longer run-times. It’s hard to compare that to a D4, since that isn’t regulated. I haven’t measured it. I wouldn’t be surprised if it ran 20% longer at the same lumen levels, just as a very rough guess… but the ratio will be different for every mode. Maybe the average is 10%, maybe it’s 30%. Couldn’t really say without detailed measurements. Maukka’s reviews might be a good place to start, since he tends to measure efficiency, but I don’t know if he reviewed the right lights for this comparison. The other big benefit of a well-regulated driver like Zebralight’s is you have access to turbo for most of the cell capacity instead of a slowly declining maximum output. Note that when I said the Zebralight SC600 IV Plus stays much brighter than the D4, I also said “when held in hand”. The Zebralight uses a 1-piece head-body unit. The body tube around your hand heats up much faster than the D4’s two piece unit consisting of head + body tube. Sure when tailstanding, results may be somewhat similar, but when held in hand there’s just no comparison. The Zebra blows away the D4. Also, turning the D4 on, it’s rather hard to tune the output to exactly 2200 lumens. Usually, when you turn it on you get either max or min. And on max it heats up and ramps down very fast. Also, some D4 ramp down faster and more than others, especially if you put in a powerful cell. I tried one of my D4 yesterday with a VTC5A and it ramped all the way down to around 50 lumens within a minute and stayed there. But another of my D4 only ramps down to around 500 lumens or so before stabilizing. Indeed. You can immediately see a Zebralight begin to ramp back up, if you grab a “hot” one that has been tail-standing awhile. When cycling, I can keep the SC600w MkIV Plus operating at it’s full 2300 lumen output, as long as the air is coolish and I’m cycling at a reasonable speed. It only lasts about 30 minutes at that output, though. I still haven’t convinced Hank to update it to RampingIOS V3 or Anduril, which both make it a lot easier to hit specific output levels. Updates also make it a lot easier to calibrate lights to have nearly the same thermal response. Even on the old version though, the thermal behavior can be calibrated… just not as quickly or precisely as the new version. It would also help to use a 3-channel driver instead of 2, like use a FET+N+1 instead of FET+1. That makes the middle modes a lot more stable, more efficient, and less hot. You could start a “want to buy” thread here. One-piece head and body tube for much better thermal management (like a Zebra). Body tube fitted for 21700. As for Zebralights, i think some of them look really nice, and the quality must be great too, judging by the price.. But too expensive for me to try if i like them.. I have own several in the past. I sold them all. I did not like the UI. The tint was a lottery, I did get a sc62 with nice WW tint. Now you have read how someone that owned several didn’t love them. Wait, I still have a H50 in my foot locker. Its 3 speed twisty. IMHO, the admiration and cult following towards Zebralight is legendary and well deserved. I just wish they were easier to disassemble… so reverse engineering could be better facilitated! I still own a nice reliable S6330 (3 x XM-L with 3 × 18650) that I break out from time to time to admire its design perfection and efficient independent 3 channel boost driver with thermal throttle. It was way ahead of its time and still far better built than most other lights in its price range. Now if I could just remove the driver without destroying the entire light so I could re-flow new emitters. The driver is double sided with integral emitters on a single mcpcb. Great for efficiency and compact size, but not so good for mod junkies.